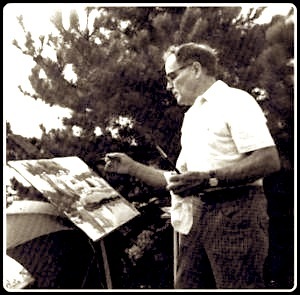 Bernhard August “Hardie” Gramatky, Jr. (April 12, 1907-April 29, 1979) was an American painter, author, and illustrator. He wrote and illustrated several children’s books, most notably “Little Toot”. Hardie Gramatky was born in Dallas, TX, in 1907 but moved to California as a small boy after his father died of tuberculosis. He attended Stanford University (earning the tuition by working as a logger and a bank teller) and Chouinard Art Institute before becoming one of Disney’s early animators in 1929. 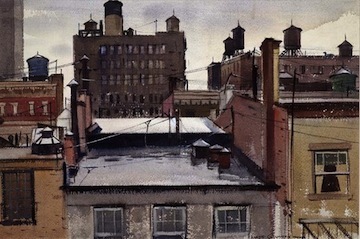 In the 1920s and `30s, he helped start the California Watercolor movement. In 1936, after a 6-year Disney contract expired, he left the company (earning $150 a week, a huge sum in the Depression) to move to New York City with his wife, artist Dorothea Cooke, to become illustrators. It was there, in his studio on Pearl Street, that Gramatky saw a Moran tugboat out his window that obviously didn’t want to work and kept making figure 8s on the East River. So in 1939 after painting many watercolors of the busy harbor, Gramatky wondered what would happen if a “tug didn’t want to tug” and wrote the story. The book got immediate attention and has been a favorite picture book ever since, and Gramatky’s fine art watercolors and giclée prints continue to be prized. He died of cancer of the ileum in Westport, Connecticut, on April 29, 1979.